Following the Nazi invasion of the Soviet Union in June 1941, mobile “killing squads” called Einsatzgruppen traveled throughout occupied areas to eliminate local Jewish populations through mass shootings. That same year, Hitler and the Nazi authorities devised the “Final Solution to the Jewish Question,” a plan to completely annihilate the Jews of Europe. At the Wannsee Conference of January 1942, plans were laid out for transporting Jews to death camps, where they would be suffocated in gas chambers and cremated. Gassing had previously been tested under “Operation Euthanasia,” which sought to eliminate mentally and physically handicapped people, deemed socially and economically “undesirable” by the Nazis. Millions of Jews perished in gas chambers between 1941 and 1944. 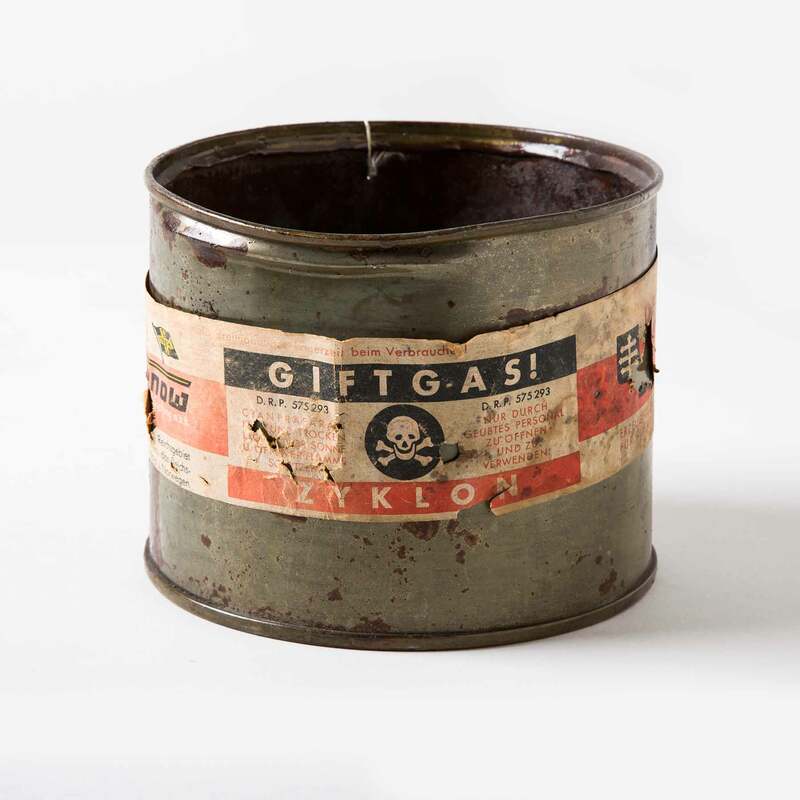 At Auschwitz, the largest of the death camps, gassing was done with a poisonous compound called Zyklon B, a form of hydrogen cyanide originally used as a fumigant. This partially full (though no longer toxic) container was recovered at Auschwitz following its liberation. Excerpt from: "On the Transports to the Death Camps." Directed By: Noemi Schory. Produced by: Liat Benhabib, Noemi Schory, Liran Atzmor. Production Company: Belfilms Ltd.
Dimensions: 4.84 x 6.37 x 5.82 in.